During a speech before parliament, Moon said that a second North Korea-U.S. summit is "near at hand" and that Chinese President Xi Jinping is expected to visit North Korea soon. Moon also said he expected Kim to visit Russia soon and that Kim may meet with Japanese Prime Minister Shinzo Abe. Moon has previously said that Kim told him he would visit Seoul within this year when the leaders met in Pyongyang in September. South Korea's presidential office said later Thursday that it had nothing to add to Moon's speech about Kim's trip. His comments were in line with previous statements, the Blue House said. They suggest that Moon is determined to push ahead with diplomacy to resolve the nuclear issue. "Now, based on firm trust among one another, South and North Korea and the United States will achieve complete denuclearization and lasting peace of the Korean Peninsula," Moon said. "This is an opportunity that has come like a miracle. It's something that we should never miss." The prospects for a second summit between Kim and President Donald Trump improved after U.S. Secretary of State Mike Pompeo made his fourth visit to North Korea earlier this month. But no breakthrough has followed. U.S. officials have recently said a second Trump-Kim summit will likely happen early next year. Some experts have raised doubts over whether Kim's Seoul trip would be realized by December. 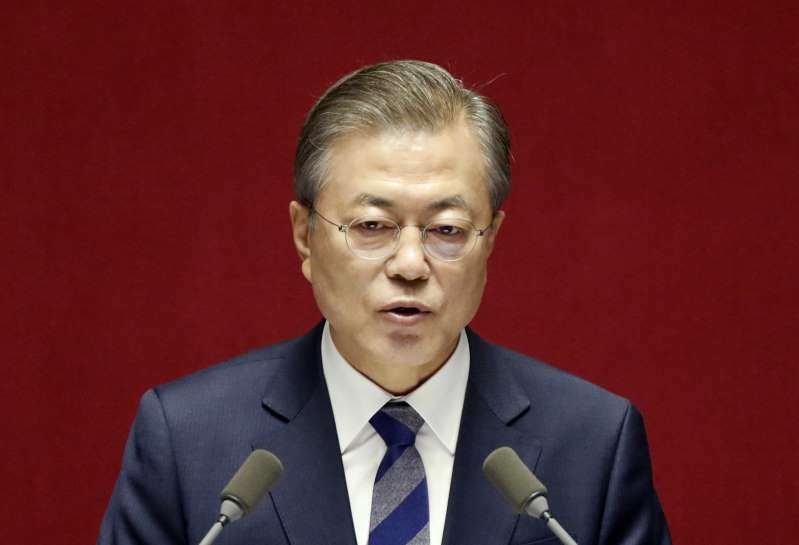 Moon, a liberal who took office last year, favors a negotiated resolution to the decades-long international standoff over North Korea's nuclear ambitions. He has facilitated a series of high-level U.S.-North Korea exchanges, including their first-ever summit in Singapore in June. The two Koreas remain split along the world's most heavily fortified border since the three-year Korean War ended in 1953 with an armistice. If Kim, a third-generation hereditary leader, visits Seoul, he would be the first North Korean leader to cross the border into the South since the war's end. Last year saw increased fears of a second war on the peninsula as he exchanged threats of destruction and crude insults with Trump over North Korea's push to develop a nuclear missile capable of striking the U.S. mainland.